Positive airway pressure is the main treatment modality in obstructive sleep apnea. The level of pressure needed for each patient is defined by a positive airway pressure titration study. Predicting those who need higher pressure or bi-level instead of continuous pressure is of a great clinical significance. This study was designed to evaluate whether voluntary breath-holding maneuver could predict Bilevel Positive Airway Pressure (BiPAP) or Continuous Positive Airway Pressure (CPAP) as the final optimal pressure in a split night study of patients with obstructive sleep apnea. Polysomnography (PSG) parameters specially oxygen saturation (SaO2) during non-rapid eye movement (NREM), rapid eye movement sleep (REM), and duration of REM in diagnostic part may help determine the type of devices as soon as possible in split night study. The present research was conducted as a cross-sectional study of adults diagnosed as obstructive sleep apnea patients undergoing positive airway pressure (PAP) titration. Demographic, anthropometric, and polysomnographic data were collected. Patients were instructed to hold their breath as long as they could after five tidal breaths in the supine position. Baseline, post breath-holding phase, and recovery SaO2 were recorded. These data were used to predict the pressure level and type of device. Seventy-eight participants (56.4% male) with the mean age of 55.7 ± 13.9 years were included in the study. Mean and SD of apnea hypopnea index (AHI) and oxygen desaturation index (ODI) were 55.9 ± 34.4 and 38.3 ± 24 per hour, respectively. Most of the participants (65.3%) were categorized as CPAP group. CPAP and BiPAP groups were similar in terms of age, gender distribution, body mass index (BMI), neck circumference, and certain polysomnographic variables. Voluntary breath-holding maneuver showed a significant correlation between minimum SaO2 and the need for changing to BiPAP during titration. Baseline and post breath-holding SaO2 were not significantly lower in either group. NREM minimum SaO2 and REM duration were the statistically significant correlated variables that predicted the need for BiPAP. Minimum oxygen following voluntary breath-holding maneuver along with higher BMI and larger neck circumference are predictors of the need to use BiPAP. Shorter REM duration and NREM minimum SaO2 were other predictors of higher chance of BiPAP during titration of the present OSA participants. Positive Airway Pressure (PAP) is the main therapeutic method for dealing with Obstructive Sleep Apnea (OSA). Different PAP modalities have been used to help patients cope with predominant OSA usually guided by a night-time PAP titration study. Recommended titration protocols suggest the start of titration with a minimum level of CPAP and a subsequent gradual increase to a higher level (either Bilevel-PAP or newer modalities). Accordingly, the patient would use the suitable device to optimally alleviate obstructive events (Antonescu-Turcu & Parthasarathy, 2010; Carlucci et al., 2015; Kushida et al., 2008).In fact, PAP titration process needs expertise and time; furthermore, it is usually interrupted by multiple awakenings which can further delay the titration process or constrain a repeat titration study. Predicting the need of those groups of patients who require BIPAP can save both time and cost. Specially, in split night study, the technician is normally under time pressure to switch CPAP to BIPAP. Many formulas derived from clinical and para-clinical variables have been developed to predict the optimal PAP. Oxygen desaturation, Apnea Hypopnea Index, and neck circumference are considered to be the main predictive factors for the prediction of CPAP pressure in the body of related literature (Abdel Wahab & Ahmed, 2017; Camacho, Riaz, Tahoori, Certal, & Kushida, 2015; Ebben, Narizhnaya, & Krieger, 2017; Noseda et al., 2009). In addition to usual clinical parameters such as BMI, neck circumference, and results of survey research used in most of PAP prediction tools, researchers have some interesting clinical maneuvers at their disposal including the five-minute wake snore test to help predict PAP pressure (Camacho et al., 2016). To the best of our knowledge, there has been no study so far investigating the role of voluntary breath-holding maneuver in the prediction process of PAP pressure. Thus, the present study was designed to see whether this maneuver along with minimum oxygen saturation during REM and NREM sleep could be helpful in deciding between CPAP and BiPAP need. The present research was cross-sectional and was conducted from December 2016 up to December 2017 which originally included a pool of 510 patients; after exclusion of those patients who were either suffering from other conditions or could not tolerate using the devices, 78 patients with split night study were enrolled. In this formula α, β, S, E, Zα, Zβ are Error type I, Error type II, standard deviation of REM duration, desired margin of error, the standard normal deviate forαand the standard normal deviate forβ respectively. Error type I and power are 0.05 and 0.80 (Chow, Wang, & Shao, 2003). It involved adult OSA participants scheduled for a PAP titration study (split night study) in two sleep laboratories in Tehran, Iran. Participants who were excluded from the research project included those who had one of the following features i.e. those unable to abide by the instructions, incapable of holding breath, having unacceptable levels of titration according to Kushida guideline (Kushida et al., 2008), having a wake PaCo2 ≥ 55 and SaO2 ≤ 80%, and lastly, those suffering from decompensated cardiopulmonary disorders and/or any acute medical condition (such as pain) preventing apnea maneuver or sleep study. This research was approved by the Ethics Committee of Shahid Beheshti University of Medical Sciences. Demographic variables (age, gender), anthropometric data (height, weight, neck circumference and body mass index (BMI) and the history of chronic medical disorders diabetes mellitus (DM), systemic hypertension (HTN), ischemic heart disease (IHD) were collected through patient examinations recorded in their medical files. Prior to the sleep study, the participants were asked to lie down in a comfortable supine position with a pulse oximeter (Massimo, USA) probe on their non-dominant index finger. The baseline steady state SaO2 was measured after taking 5 tidal breaths. Then, the participants were instructed to hold their breath as long as they could. Minimum SaO2, breath-holding SaO2, and recovery SaO2 along with the duration of breath-holding and time taken prior to SaO2 fall and recovery (in seconds) were recorded by a stopwatch. The night-time polysomnography (PSG level I) and the titration study (Philips Respironics Software) and (BiPAP, Respironics, USA) were scored manually according to 2016 American Academy of Sleep Medicine (AASM) criteria. Total recording time (TRT), total sleep time (TST), AHI, ODI, NREM and REM duration and minimum oxygen saturation, duration of SaO2 less than 90% (T < 90%), duration of sleep in each body position, and the pressure level required to alleviate respiratory events were extracted from the PSG results. Participants were assigned to either the CPAP or BiPAP groups according to their optimal PAP modality. If the patient is not controlled with pressure 15 cm H2O, then CPAP would be changed to BIPAP. A T-test analysis was run to assess the effect of demographics and other variables on the PAP group. A similar analysis was done to compare two groups in a non-normal situation by Mann-Whitney U Test. Meanwhile, Chi-squared test was run in contingency tables for categorical items. Besides, in order to assess the effect of variables in the allocation of participants to BiPAP group, two statistical methods were used: logistic regression and decision tree analysis. Formal measures of classification performance and model evaluation criteria including sensitivity, specificity and positive and negative likelihood ratios were taken into account. The area under the curve (AUC) of a receiver operating characteristic (ROC) curve is a way to reduce the ROC performance to a single value representing the expected performance. The data were analyzed by IBM SPSS-22.0. Probability Value of 0.05 was set to be statistically significant in two-tailed tests. A total number of 78 patients (56.4% men) with the mean age of 55.7 ± 13.9 were enrolled from December 2016 to December 2017. Mean ± SD of AHI and ODI were respectively 55.9 ± 34.4 and 38.3 ± 24 per hour. Figure 1 represents the flow chart of included and excluded participants; 51 (65.3%) were controlled with CPAP and the remaining 27(34.7%) needed BiPAP for avoiding respiratory events. Demographic, anthropometric, polysomnographic, and titration data of each group are represented in Table 1. Mean and SD of CPAP pressure were 11.8 ± 2.9 mmHg.In BiPAP group IPAP and EPAP are 21.4 ± 3.3 and 15 ± 2 mmHg respectively. The data on voluntary breath-holding maneuver (durations and SaO2 levels) were represented in detail for each group (Table 2). Both groups were similar in terms of the PSG results (p > 0.05). Logistic Regression: BiPAP was assumed as the reference group. Polysomnographic and breath-holding variables were evaluated for their changing impact on BiPAP. Multivariate Logistic Regression Analysis (Table 3) showed statistically significant odds for BMI, neck circumference, REM Duration, Minimums NREM SaO2 and Average SaO2 changed from CPAP to BiPAP (1.75, 1.9, 1.45, 1.59, and 1.8, respectively). Decision Tree is a nonparametric method for classification. It uses the Classification and Regression Tree according to the specific variables used (Continues and Categorical) by Classification And Regression Tree (CART) and Chi-squared Automatic Interaction Detection (CHAID) algorithms. 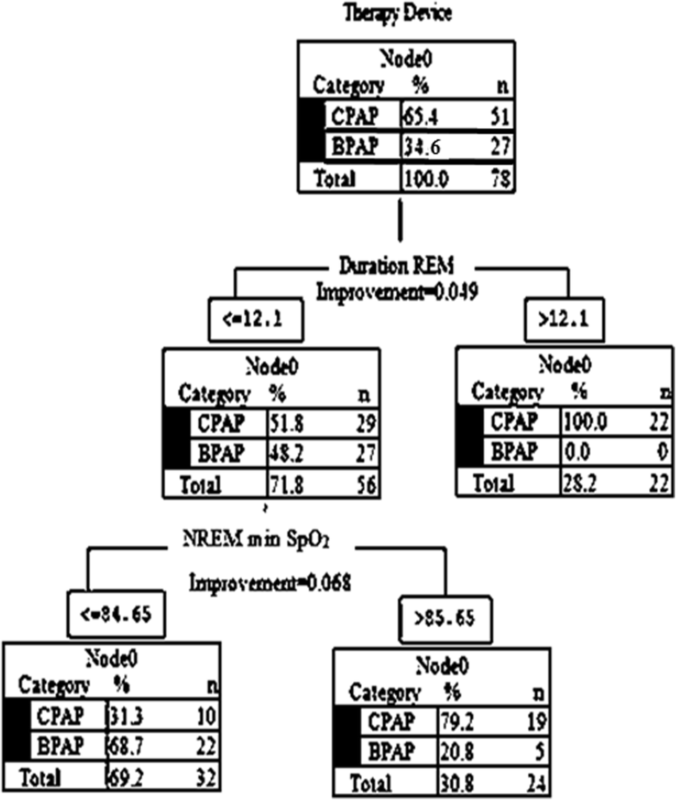 REM Duration less than 12.1 min was considered as the root of the Decision Tree, meaning that REM duration more than 12.1 min showed a 100% probability of continuing CPAP. In those participants whose REM Duration is less than 12.1 min, minimum SaO2 during NREM was the next level node changing CPAP to BiPAP (Fig. 2). NREM minimum SaO2 levels higher than 79.2% caused an 87.5% likelihood of continuing CPAP as the PAP treatment, but levels lower than 84.6% led to 31.3 and 68.7% of likelihood for CPAP and BiPAP, respectively (Fig. 2). Overall analysis of Decision Tree showed an acceptable sensitivity, specificity and positive and negative Likelihood for this model Table 4. 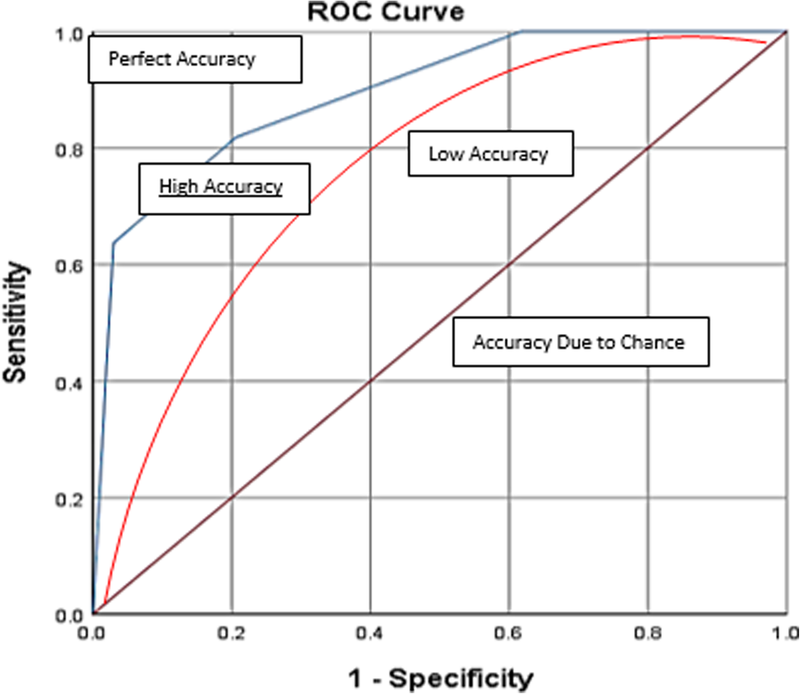 Decision Tree analysis shows also a vast area under the curve of ROC (88.6%) in defining the type of PAP device (Fig. 3). In developing countries, where patients do not enjoy reimbursement for sleep study, non-invasive mechanical ventilation and CPAP, majority of the patients admitted to the sleep clinics are in moderate to severe OSA stage and cardiovascular disease (Setareh, Mehrnia, & Mirabi, 2018).In these patient, device titration is recommended in sleep lab. Optimal device titration is a titration that cannot only remove respiratory events while having optimum leak but also lets the patient have a comfortable sleep and suitable oxygen saturation. This would be extremely helpful in sleep lab, specifically after midnight when only the technician can attend the patient. On the other hand, in such a situation, changing CPAP into BiPAP can be extremely expensive for the patients, so the more precisely we can decide on the type of device drawing on various parameters, the shorter is the time needed by the technician to make a logical decision. This would ultimately lead to a more reliable night time titration of device. Two seminal studies in the field of Manual Titration Obstructive Apnea have been introduced according to AASM Guidelines (Berry et al., 2010; Kushida et al., 2008).The first study by Kushida addresses the OSA patients without comorbidities. The study takes into account variables such as the number of respiratory events, supine position, and REM Sleep, but does not provide any protocol for low SaO2 except during events. The second study by Berry is conducted on patients suffering from hypoventilation and OSA, and explains the protocol for utilizing BiPAP in low SaO2 situation during wake and sleep from the onset. However, in a number of patients such as those participating in the current study, Baseline SaO2 is 94.7% which declines to lower than 84.6% in NREM stage. As a result, this can contribute to the likelihood of changing CPAP to BIPAP (Fig. 2). Studies on mechanism of cortical control of ventilation showed that the duration of breath-holding can be limited by several factors, such as sensitivity of peripheral chemoreflex, spirometry parameters, the arterial PCo2, PO2,previous maneuver (Bain et al., 2017; Trembach & Zabolotskikh, 2018).Ventilatory response to PCo2 and PO2 is considerably variable between patient (West & Luks, 2016).The duration of voluntary breath-holding doubled after breathing a hyperoxic mixture or after pre-hyperventilation. Those whose minimum post breath-holding SaO2 was lower, might have a higher likelihood of changing CPAP to BiPAP. This might be useful for technicians as a straight forward method to have an estimation of these ventilatory responses and help them to choose BiPAP over CPAP (Table 2). The borderline predictive role for minimums oxygen saturation in voluntary breath-holding maneuver in the study may be limited by variable peripheral chemoreflex and spirometry parameters in these patients in normal range (Bain et al., 2017). At different levels of hypoxia, there is a nonlinear response to oxygen and most of the responses to level of PO2 are less than 50 mmHg. These physiological findings display considerable variability among individuals. Therefore, it seems that measuring oxygen desaturation during NREM sleep and minimum oxygen saturation during voluntary breath-holding maneuver are the predictors of a need of BiPAP during titration with a good trade-off between sensitivity and specificity shown through ROC curve analysis. Some other studies attempted to find formulas specific for different races. Basoglu et al. proposed a new formula with the same variables among Turkish population (Basoglu & Tasbakan, 2012).Their formula utilized neck circumference (NC) and oxygen desaturation index (ODI). It can be easily concluded from every titration protocol that more severe OSA patients need BiPAP more frequently (Kushida et al., 2008). Our results were in concordance with more severe OSA and lower SaO2 during NREM sleep. Camacho et al. in their systematic review of 26 studies on mathematical equations of CPAP prediction, reported BMI and mean oxygen saturation as the most heavily weighted variables along with BMI, AHI, and neck circumference as the most frequently used variables (Camacho et al., 2015). The likelihood of changing from CPAP to BiPAP was almost doubled by higher BMI and neck circumference in our study population. Meanwhile, Hoffstein formula (Miljeteig & Hoffstein, 1993) is the most widely used CPAP prediction tool worldwide, which uses BMI, AHI, and neck circumference. Although it is widely used for many years and validated in many different studies, this study suggests that these parameters were not enough compared to other factors (Fig. 2). OSA is also a well-known etiology of REM deprivation. OSA causes the reduction in REM sleep percentage. The more intense OSA, the shorter the length of REM (Kimoff, 1996; Wang et al., 2015).Therefore, a relative short REM can indicate an increase in the probability of need for BiPAP. The present study was designed to evaluate BiPAP versus CPAP preference by anthropometric, polysomnographic, and other type of data on a clinical maneuver called voluntary breath-holding maneuver. We used decision tree analysis to find if there is any relationship between patient’s variables and the need to use BiPAP or CPAP, by using some of the most common polysomnographic and anthropometric variables. Although these results cannot render the titration procedure useless completely, it is one of the limitations of the study but can help the technicians to pay attention to special variables in order to save time, specifically during split-night titration and to choose the more suitable device as soon as possible. The main focus in this study was using of logistic regression analysis as a parametric model to find an equation between independent variables with respect to its dependent variable. Technically by logistic regression application, it was estimated the effect of each independent variable on the odds of change of device therapy from BIPAP to CPAP.On the other side, we gained advantages of the decision tree to find out considerable overlap between the variables used in the logistic regression equation and the decision tree. It might be suspected that the two procedures are picking the same cases like what was seen about REM duration and NREM minimum SaO2. Minimum oxygen following voluntary breath-holding maneuver along with higher BMI and larger neck circumference are predictors of the need to use BiPAP. Shorter REM duration was another predictor of higher chance of BiPAP during titration of the present OSA participants. Future research projects can have more homogeneous forced vital capacity (FVC), forced expiratory volume in 1 s (FEV1), and investigate and explore a host of other unknown factors in order to avoid having a heterogeneous sample, which seems to be the main cause of obtaining a borderline P value regarding minimum SaO2 in breath-holding maneuver. Authors kindly appreciate Aram Karami Rad and Naeime Mohammadi as the technicians of sleep laboratories for their great cooperation in the study. JS designed the study, helped in data collection and final edition of the article, MM helped in data collection and final edition of the article, MA wrote a part of article draft, BK analyzed data and wrote the result of the study and PAN designed and supervised the study and final edition of the article. All authors read and approved the final manuscript. Informed consent was obtained from all individual participants included in the study. The current study is approved by ethics committee of NRITLD number of IR.SBMU.NRITLD.1397.530. Carlucci, Annalisa, Ceriana, Piero, Mancini, Marco, Cirio, Serena, Pierucci, Paola, D'Artavilla Lupo, Nadia, . . . Fanfulla, Francesco. (2015). Efficacy of Bilevel-auto Treatment in Patients with Obstructive Sleep Apnea Not Responsive to or Intolerant of Continuous Positive Airway Pressure Ventilation J. Clin. Sleep Med., 11(9), 981–985. doi: https://doi.org/10.5664/jcsm.5008.